Declan Rudd is enjoying having a close-up view of Preston North End’s blossoming defensive partnership of Ben Davies and Jordan Storey. The young centre-halves have started the last four games together, with keeper Rudd the last line of defence behind them. Rudd has spoken before of his admiration for Davies, labelling him a ‘Rolls Royce’. And he has come up with a tag for Storey who has really looked the part over the last few weeks. “I call him the Exeter Rio Ferdinand,” said Rudd, who will make his 100th league start for Preston in the clash with promotion hopefuls Norwich City at Deepdale. “Jordan make the game look so easy. To come in and play as well as he has done at this level after not many games in senior football, is superb. “I don’t think something like that happens very often if the truth be told. Rudd, 28, is pleased to be reaching the milestone start in the PNE keeper’s jersey. His appearances have come in two spells, the first starting six years ago when Rudd signed on loan from Norwich. He stayed for 18 months before going back to Norwich to try and force his way into first-team contention at Carrow Road. Rudd returned to Preston in the summer of 2017 on a permanent basis, in between had been limited game-time with the Canaries and a loan spell at Charlton. It is a nice coincidence that his 100th start will be against Norwich, a club with whom the keeper has had a lifelong association. Said Rudd: “Being from down there, I was a Norwich fan growing up and joined their academy at the age of eight. “I was a season ticket holder as a kid so I’ve got a lot of affection for them. “They gave me the chance to be a footballer. “But things happen in the game of football and I’m glad to be here at Preston now. “It’s six years since I first came on loan. That seems a long while ago and a lot has happened since. “I went back to Norwich and then came here again, it went full circle. “Starting 100 league games is a nice milestone to hit, especially when there was a big gap in between. League start number 99 came in Saturday’s 2-1 win against Bolton. Only once was Rudd called into serious action, diving to tip over a header from Josh Magennis two minutes into stoppage time. Had he not made that save, the hosts would have rescued the most unlikely draw – North End having been the dominant side. Rudd said: “In recent games we have dominated the opposition and restricted them to very few chances. “That is credit to the lads who work so hard. “That’s life for a keeper, you can be quiet for 91 or 92 minutes and then suddenly have a save to make. Although it is only 18 months since Rudd severed ties with Norwich to sign for PNE, the current Canaries side is unrecognisable to the one he played in. The East Anglia club have had a big turnover of players in the last two seasons and their current position is an indicator to how successful that churn has been. Rudd said: “I watched their game against Ipswich on television on Sunday and not one player in the starting XI was there when I was there. “Norwich is different club now, it is run differently and the set-up has changed. Rudd has family and friends who are Norwich supporters. The fact the game is on a Wednesday night means it is not travel-friendly but as ever, Rudd’s dad will be at Deepdale. “Dad has been a Norwich all of his life,” said Rudd. “But he comes to all of our games and there will only be one team who he will be supporting. 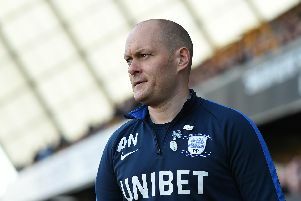 PNE will be aiming to make it six games unbeaten when Norwich visit. Their fortunes have taken a turn in the last month since a 3-1 defeat in the FA Cup to Doncaster Rovers. They have won three away games on the spin, with draws against Swansea and Derby at Deepdale. “You go back to earlier in the season and the talk was about not being relegated,” said Rudd.